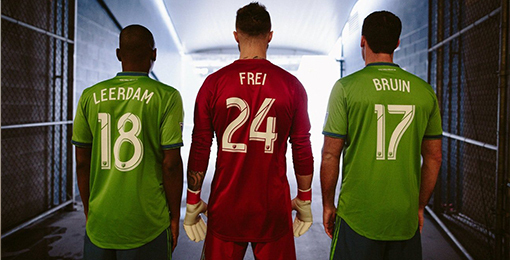 If you want to buy cheap seattle sounders shirt for 2018-19 season, buy it here in cheap-football.com , Check our exclusive range of seattle sounders Football Shirts / Soccer Jerseys and Kits for adults and children at amazing prices. Get the cheap seattle sounders jersey shirts, soccer kits with wholesale price, Free Shipping Worldwide! Seattle Sounders are an American professional soccer club based in Seattle, Washington. The Sounders compete as a member of the Western Conference of Major League Soccer (MLS). The club was established on November 13, 2007, and began play in 2009 as an MLS expansion team. The Sounders played its inaugural match on March 19, 2009, winning 3–0 over the New York Red Bulls. Seattle has been among the league's most successful teams, winning the Lamar Hunt U.S. Open Cup four times, the Supporters' Shield in 2014, and the MLS Cup in 2016. The team has qualified for the MLS Cup Playoffs in each of its nine seasons and competed in the CONCACAF Champions League five times, advancing to the semifinal round once. The team set MLS records for average attendance during its first eight seasons.